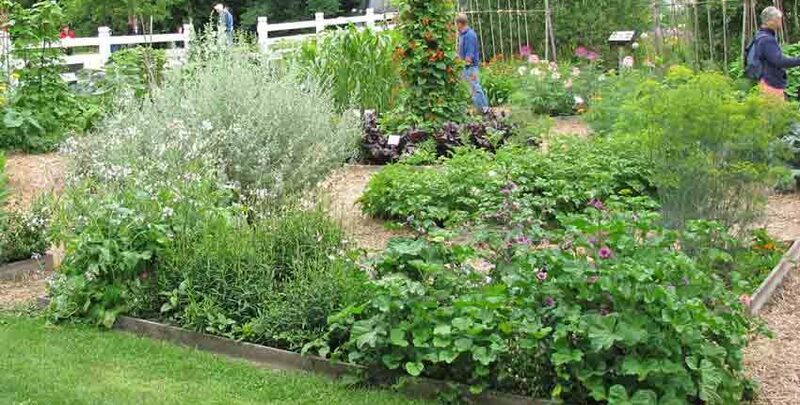 The word garden means many things to different people; flower gardeners immediately think of flower beds while vegetable lovers have an image of bushy, green-leaved plants loaded with fruit. 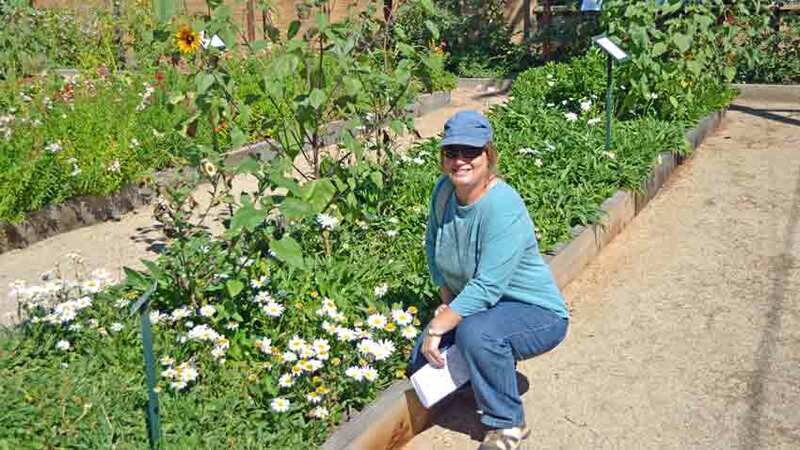 Bird and butterfly watchers see pollinator attracting flowers and herbs in their mind’s eye while a novice may remember fantastic botanical or flower gardens they’ve visited and immediately feel intimidated or overwhelmed. A garden can be easy and simple, whether it is for food, flowers, butterflies or just a spot with beautiful colors and relaxing, invigorating scents to relax after work. We’ve visited a number of different gardens in our travels – from very simple and straightforward food production plots to professionally designed and maintained showcases. Today is about seeing possibilities for your space, budget and time – large, small or somewhere in between. 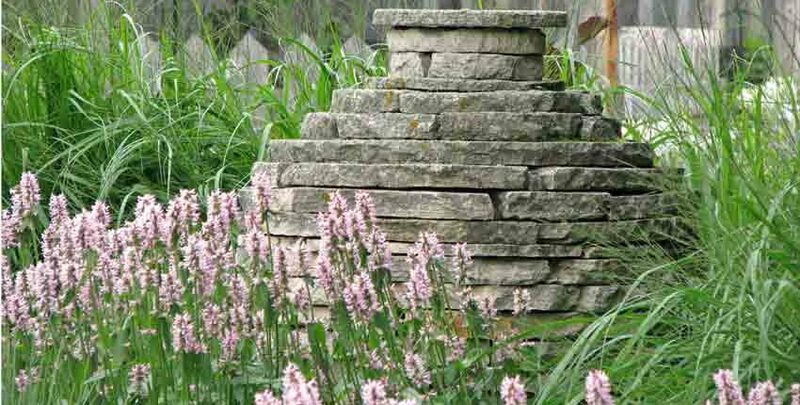 A highly pleasing garden needn’t be complex or difficult to create or maintain, in fact some of the most impactful and pleasing gardens are very simple. Most of these aren’t really a complete garden by themselves, but are corners, nooks, crannies or otherwise difficult or unused spaces which lend themselves to delightful spots for a pause to enjoy their beauty. 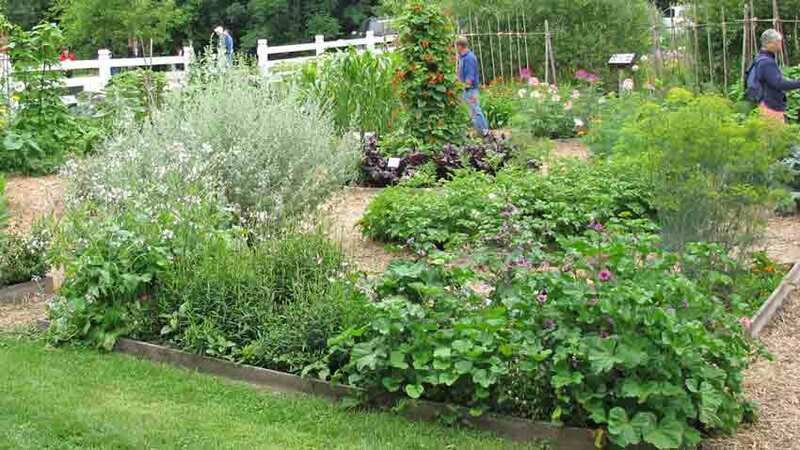 The more formal or structured garden bed is very popular and is what has been featured countless times in gardening, home improvement and lifestyle magazines. This type of garden setting takes some planning and work to initially construct and plant, but can be an attractive center point for years to come. 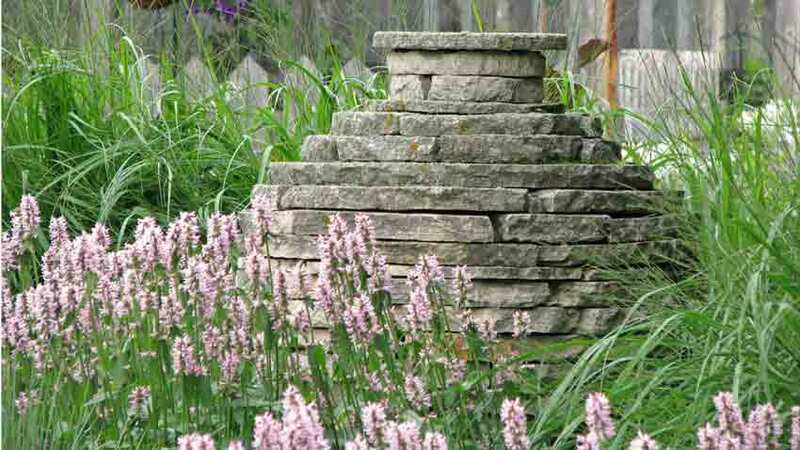 This stone pillar and background picket fence will anchor many different types of flowers or shrubs, giving built-in flexibility for future changes. Seed Savers Exchange built a great example of a relaxed but engaging and visually interesting garden; with the corners defined and planted with multiple entry points and walkways. The use of different heights, leaf shapes, textures and colors creates a moving interest and eye-path to keep a visitor engaged. 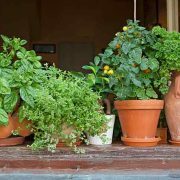 If you don’t have a range of herbs and flowers in mind to start with – don’t worry. 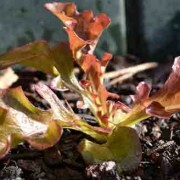 Choose some that you like and plant them as an experiment to see what develops. It’s not difficult to change a planting or two next season. 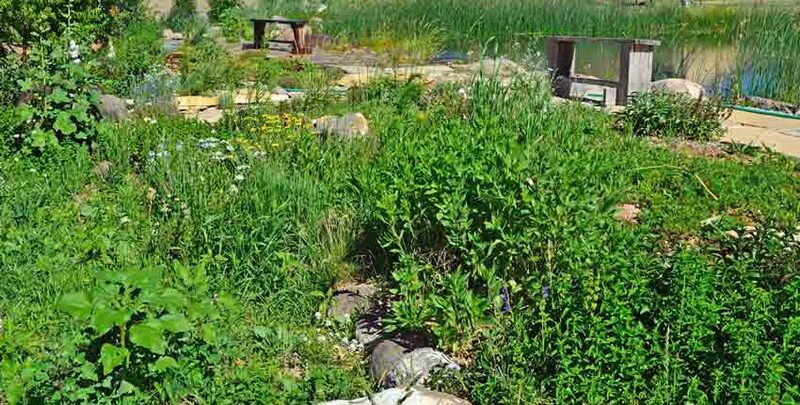 If you are not comfortable with the “try it” approach, research some of the numerous garden design or landscape design books and articles that are readily available for some ideas on where to begin. Browsing through photos of gardens on the internet is a very easy way to see what different designs look like, giving you ideas to try on your property. The Luther Burbank house had several examples which would be easy to try. 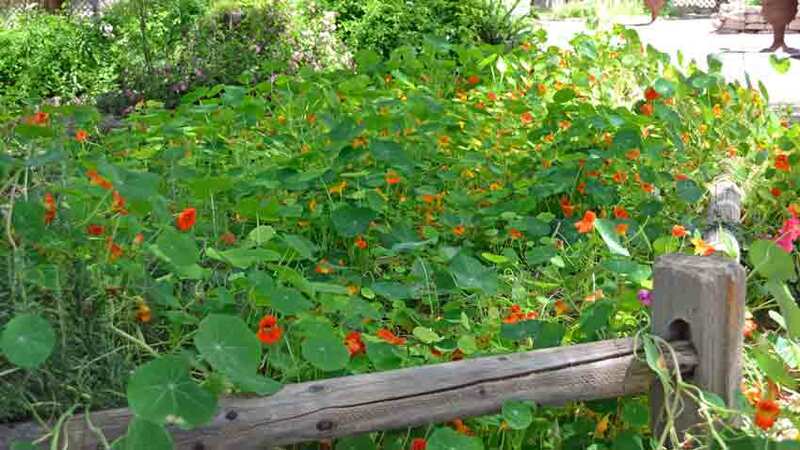 A split rail fence gives visual interest and directs the eye to the bush and low flowers. The brick walkway is the border for the bed. 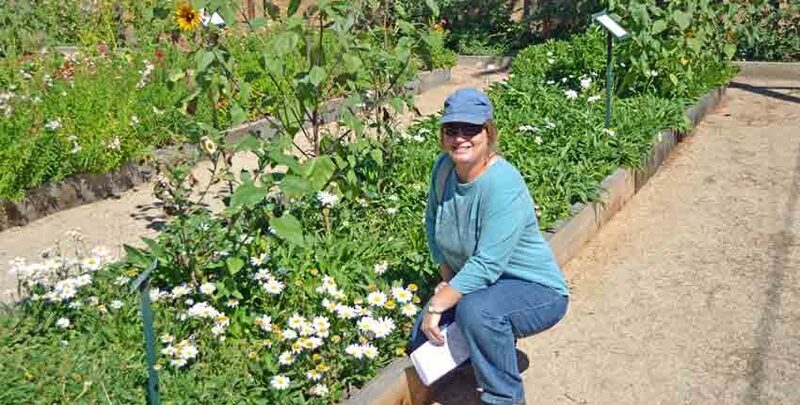 Further to the back of the Burbank property were these traditional structured flower beds, used to showcase and educate about different flower species as well as the pollinators visiting them. The beds themselves are very simple – just wooden timbers pinned in place with garden soil filling them to create the bed. Aged logs would give a more rustic feel if they are plentiful in your area. 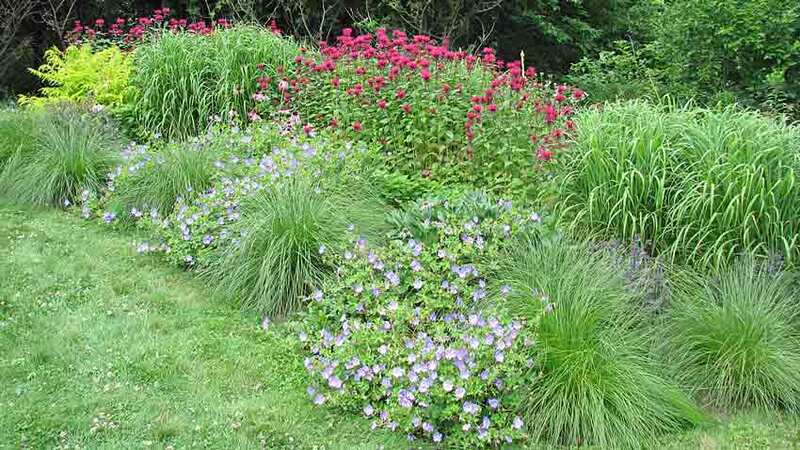 A bed of this size could easily support both annual and perennial flowers and herbs, depending on how close to the house you placed it. Using taller and more robust flowers like sunflowers would create a privacy break as well as a windbreak when used upwind of a more delicate part of the vegetable or flower garden. 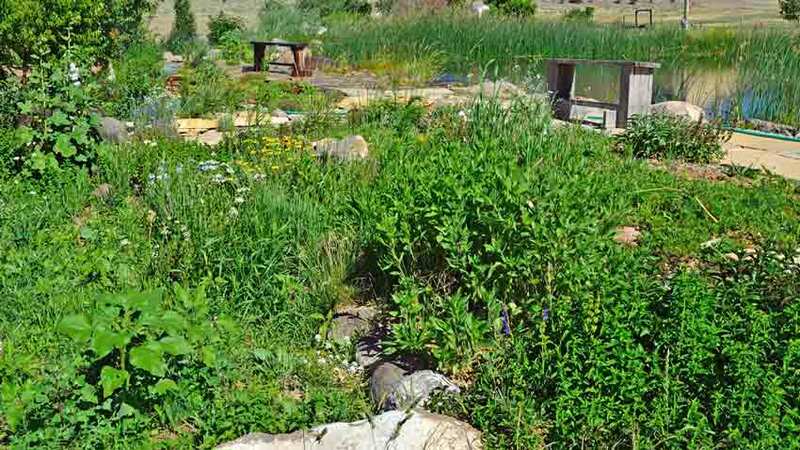 A flower or herb bed can be concealing as well as useful and attractive, such as this treatment of a slightly swampy area at Hell’s Backbone farm in Boulder, Utah. 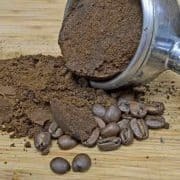 It is very informal but highly useful and productive as well as appealing. The catchment pond is at the upper right, with the dam underneath the two benches. Over the years it has become slightly more permeable, resulting in this perennially messy and muddy area. 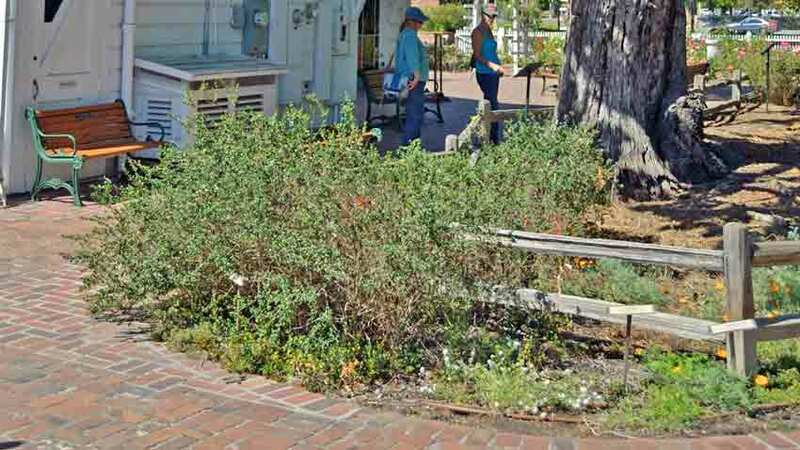 To encourage less traffic, a mix of annual and perennial flowers as well as commonly used and thirsty herbs were thickly planted. 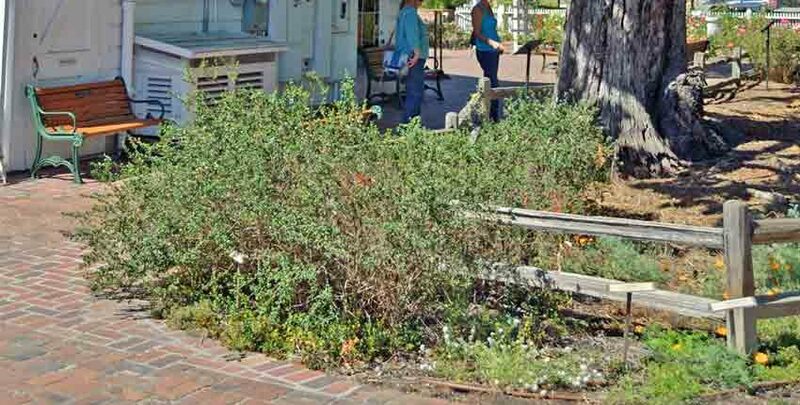 This had two benefits – it kept traffic down, lessening the spread of a muddy mess and the abundance of plant growth absorbed much of the moisture so there was no standing water, fewer mosquitoes and a large harvest of flowers and herbs for the restaurant. 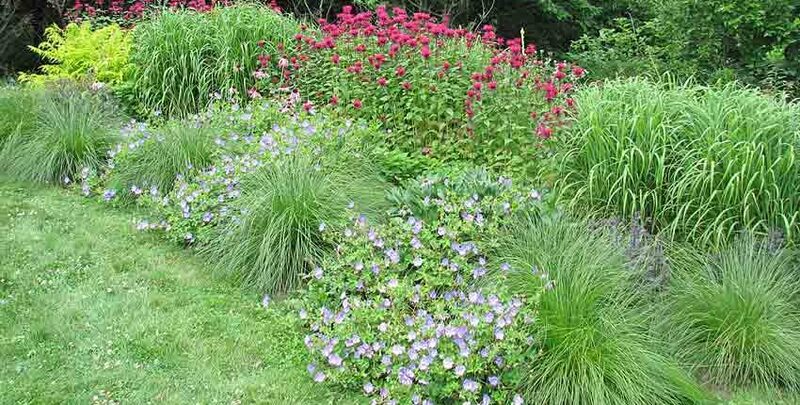 Another informal but well-designed approach uses annuals and perennials amongst different height grasses to attract different pollinators and create a sense of lushness without adding much if any additional work after the initial planting is done. This area is very serene and soothing with the sound of the different grasses swaying in the breeze, while the multiple aromas drifting from the flowers greets you. After just a few moments, you notice the different butterflies, hummingbirds and bees among the flowers and take a seat on the stone bench just out of the photo at the bottom left. 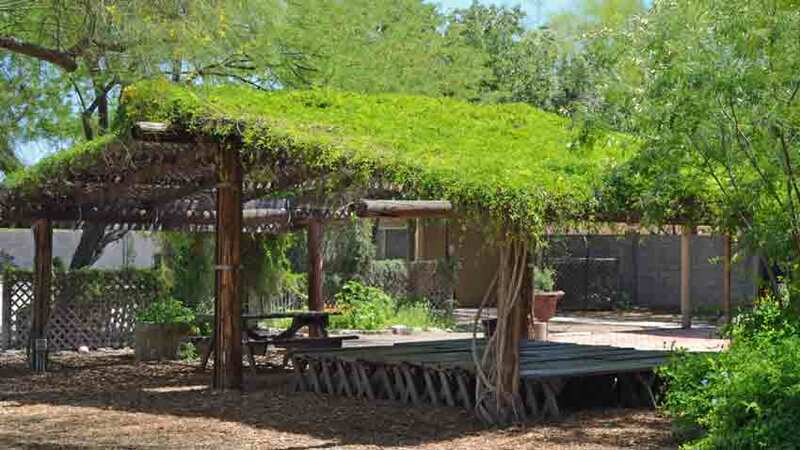 On a trip to a farm in Phoenix, we saw this living shade structure with the lattice work trellis next to it and small herb garden behind it. 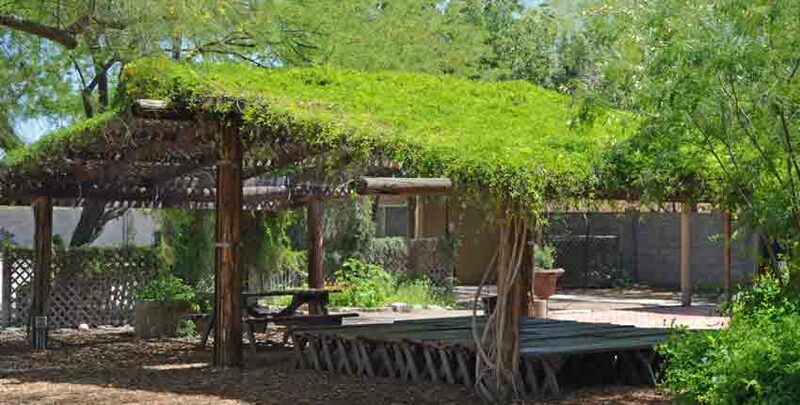 The structure is old telephone poles buried in the ground with a heavy creeping vine providing the living shade. 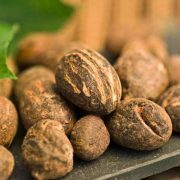 There are several possibilities here, without needing this heavy of a structure if you plant a fast-growing vining plant such as achocha, cucamelons, vining petunias, ivy or morning glory that are also lightweight. A structure to support the vines would still be needed, but wouldn’t need to be as expensive or heavy duty. The lattice work trellis is a good idea, being quick and simple to put together while giving some initial privacy until the vines fill in and creating a border or separation of spaces. The small herb garden behind the structure is simply made from recycled chunks of concrete dry stacked into a circle about a foot high and filled with garden and potting soil, then heavily planted. 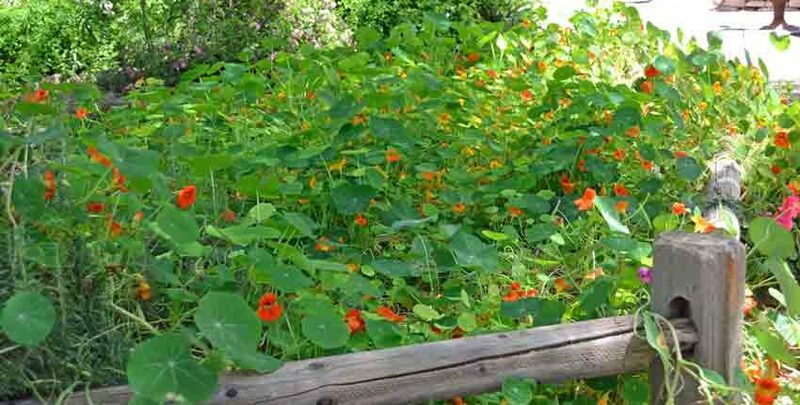 Something as simple as a large bed of nasturtiums can be attractive and engaging at the same time. These are planted outside of an upscale dinner restaurant where the flowers, leaves and buds are used as garnish on the dishes and table decorations. Another use would be to pickle the buds, as in our recipe Pickled Nasturtium Pods, to have a locally produced caper-like ingredient. 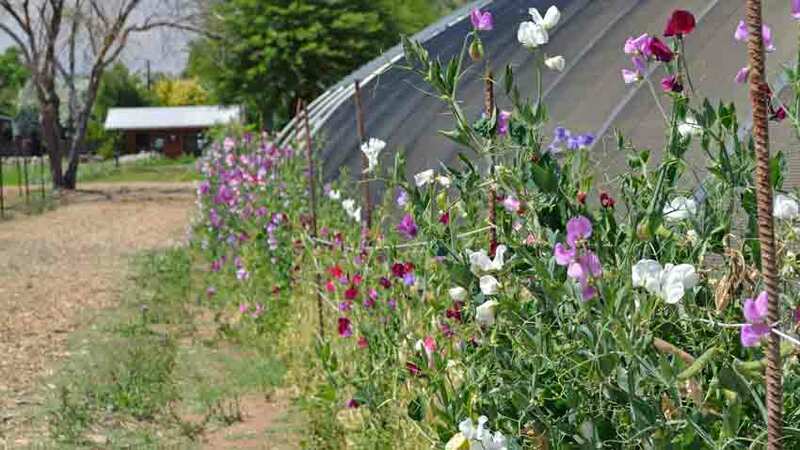 Sweet peas on a very basic, quick to make trellis lining the edge of a greenhouse creates a rustic authenticity as well as bringing beautiful colors and wonderful scents to the immediate area. 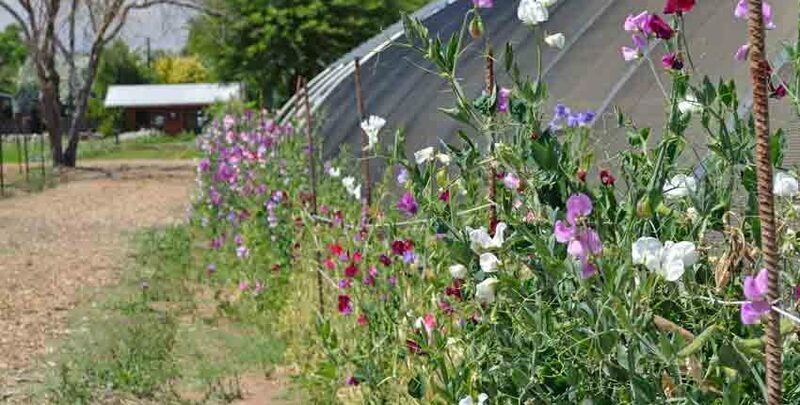 This was also on the Phoenix farm in the middle of April, so the sweet peas can be a source of shade for a longer time in a less heat soaked climate. Using this concept for a living shade on the south side of a greenhouse with heat tolerant vining plants or tall sturdy plants such as sunflowers would be another functional and inviting solution. Heirloom flower seeds this way! Heirloom herb seeds that way! 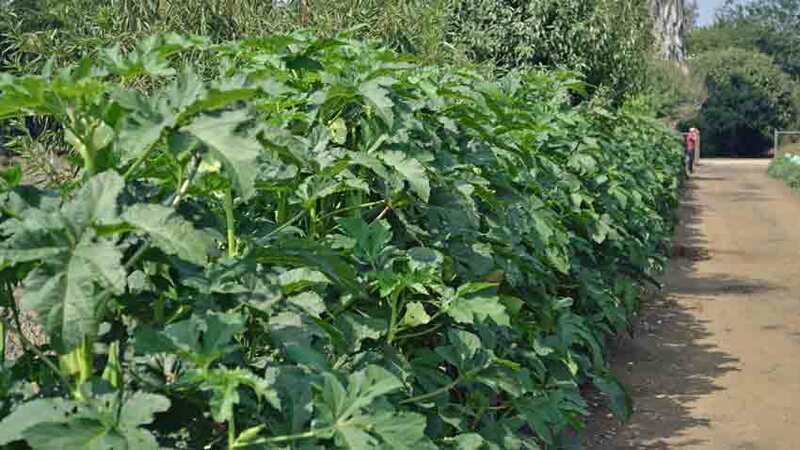 How about growing an annual living hedge which gives you multiple benefits of additional privacy, windbreak and fresh food? Not to mention colors and scents, depending on what you choose to plant along your property fencing. Okra is being used in just this way here. 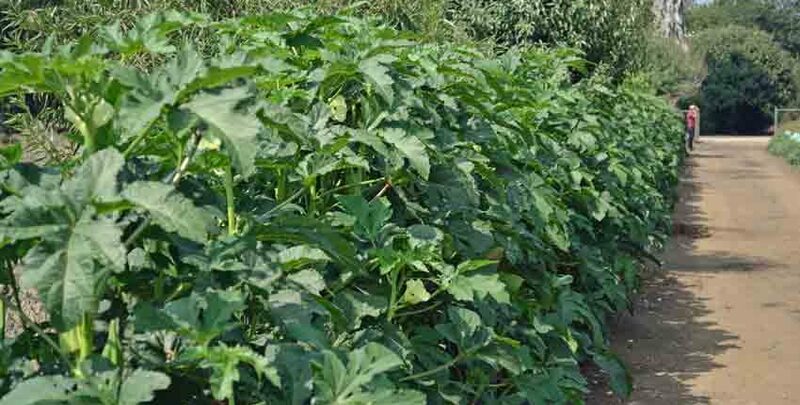 The plants were above six feet tall in the middle of August, with enormous amounts of fresh okra for the picking. That is a five foot fence in the background, so you’ve got a good indication of just how tall this hedge grew. 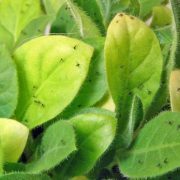 Other choices for this approach are thickly planted strips of tall sunflowers, sesame, hollyhocks, pole or vining beans, hibiscus, vining petunias, poppies and peas or sweet peas. 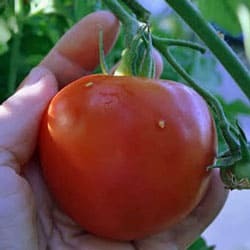 Your climate and situation along with what you like to grow or eat will help determine what works well for your property. What about your garden, do you have a success story or photos to share and brag about? Please, let us see and hear about them! Your successes will help inspire others, and just might answer a question someone has.